Autumn is my favourite time of the year as well alongside with spring. It's not too hot or cold plus you get to wear your best clothes while observing changes of nature around you. That vintage dress is divine, by the way. Autumn is my absolute favorite season. We are starting to have that very perfect autumn weather as well - the weather where it is bright and sunny, but cool and a bit windy. Perfect for a walk or a bike ride. We don't have as much color as you yet, but when it comes, it is everywhere here. I'm an outspoken lover of the non-summer months, I have to say (even in Lithuania, where the winter was -20C for 3 months). Crazy, I know. You look wonderful! I secretly love autumn too! Even though it only means that a very snowy winter is ahead! Living in New England can be way tooo cold sometimes! I used to hate fall, but the older I get the more I do like it ( I am a summer gal, July born)I love all the colors and the new clothes that I get to wear, even if it is just my old fall clothes made new again because I haven't seen them in months. Waouh ! Beautiful colors ! In Paris, seasons are not regular. This week-end it was summer, and maybe tomorrow, it'll be very cold ! If autumn always looked like this, I would like it better. I'd love to experience autumn too, sadly it's only rain rain and more rain. That's about the only autumn we'll experience from where i come from. Your outfit just look so autumny! And I find that I'm in love with ideas of the seasons, rather than the seasons themselves, so I'm always a little disppointed when the long awaited autumn turns out to be dreary and grey, or the spring is either too wintery or too summery already, etc. I'm a perpetually disatisfied girl I guess. you look like a lady from hoolwood gratest years (till 50'). you have that look of h. glamour. that vinatge dress is perfect. i absolutely love it. and the hair style: superb! fall and its colours, well yes on your pictures.. Autumn is for me the start for wearing stockings! Nice colours - love the pic of you and the yellow-oranges leaves! Hei, saako kysyä missä tuo eka (ja tokavika) kuva on otettu? Mahtavat värit! Autumn is definitely my favourite time of the year. Your dress & looks stunning as always! Den klänningen är helt fantastisk! Adore autumn! Just like I adore your blog and your impeccable sence of style. Det osar höst av dem! Lovely pictures as always! Hösten är vacker! Jag tror dock att en anledning till att man har svårt för höst är för att den liksom lovar att det kommer vara mörkt det kommande halvåret. Det här året också. The pictures with you are truly amazing! I love the colours, and how you almost "melt in" with the environment. Every morning when I go to school with the bus, it's 50 minutes of just looking outside the window, admiring the beaty of the autumn. It's enchanting. Casey : Oh, where are you moving? Susanne : Jag är i Helsingfors, fast det visste du kanse redan; i Sörnäs för att vara mer exakt. Oh that gorgeous fall color! It's stayed fairly warm out here, and the trees are just thinking about turning. I, like you, live in a place with wretched winters and most people think I'm mad for being a summer-hater. But I just loooooove fall! I wish we had autumn here, but we don't. It's 90 degrees one day and then 45 degrees the next. gorgeous! that first photo is absolutely stunning!! You look so romantic. I do adore autumn colors, but summer is still probably my favorite season. Hi you in pretty dress! I have a challenge for you in my blog! Fin blogg du har! Jag dammsuger nätet på andra finlandssvenska bloggar och hittade hit. Hi there, just found your blog a while ago and really like your outfits! I'll comment in English so that all of your readers can understand. 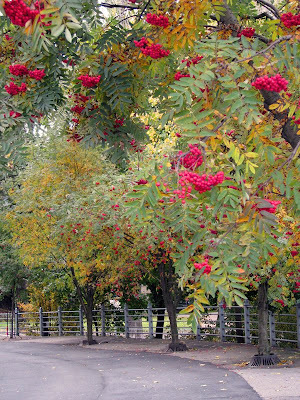 Anyway, I've heard another saying; that if the trees carry lots of rowanberries it won't be a snowy winter. The trees can't carry both berries and snow. I'm yet to find out if it's true, haha. I'm way up North in Sweden and the trees here are filled with rowanberries. I'd rather have snow than mud though(I have kids...). It's a glorious season indeed... great perfect Fall look. Loving the back ground...hope to hear fm you, you r simply fab!!! The fall hasn't even started over here yet. I love, love, love your dress!! beautiful dress in difficult colour! the photos: simply perfect too. I think the same about autumn, but here, in Madrid, I have not see those colours in the trees (but her we have a red autumn too).